Works on all versions of AIMsi. The Advantage DLXi combines the rugged durability and reliability of the Blaster Advantage with our leading edge print technology to offer unsurpassed performance. The DLXi printer is the most powerful desktop printer on the market today with best-in-class print and first label out speeds, popular language emulations, patented USB A host technology, and a full connectivity suite. 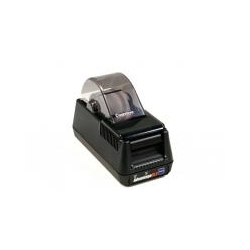 The Advantage DLXi is the ideal thermal printing solution for a wide range of applications where performance is paramount, durability is essential, and space is a factor. Why Choose the Advantage DLXi? Advantage DLX offers unsurpassed print and first label out speeds, a full suite of communication options including USB (standard on all printers), and easy integration with ERP and legacy installations. Durable – The Advantage DLXi is engineered with a metal frame and metal print mechanism for exceptional reliability and durability. Mobile – The Advantage DLXi is compact. It can fit in a small work area or be cart mounted for additional mobility and ease of use. ***Thermal Transfer is used for locations that have alot of sunlight and for long lasting labels. Thermal Transfer requires a wax ribbon to print. ***Direct Thermal has issues with fading after being on the label so long and are should not be used in locations with direct sunlight on the labels.